Beautiful You: #CountdownToChristmas Week 2 | Favourite Seasonal Drinks! #CountdownToChristmas Week 2 | Favourite Seasonal Drinks! Today's instalment of #CountdownToChristmas is all about our favourite Christmas drinks that we love to get drunk the Christmas period. Now I am not one to drink coffee, I have never really liked the taste of it so I try to stay clear of that but I do love a good hot chocolate! During the Christmas period in Bournemouth they have a Christmas market and a bar where you can get Winter Pimms and Mulled Wine and I love going there with my house mates and sitting around with all the festivities going on. 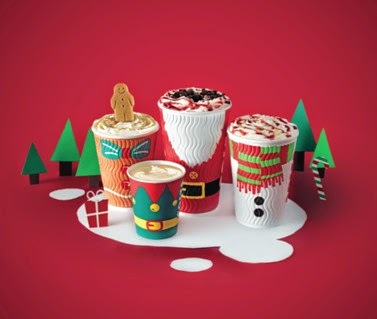 I am also a massive fan of Costa's seasonal drinks range especially their brownie hot chocolate this year. It doesn't take too different from the normal hot chocolate but it is a bit more creamier. I have also tried the White Hot Chocolate but I found this a bit sickly so I didn't have it again. In Starbucks this year they have a Honey and Almond Hot Chocolate and the honey part really appeals to me but I'm not really sure about the almond however I think next time I am near I think I am going to try it! I'm sorry that this blog post is really short and quite rubbish but I have been so busy this week but I know it isn't an excuse. I am going to be blogging about why my week was so busy tomorrow so definitely keep an eye out for that because it is quite exciting!! Anyway, I am going to be back to normal next week because I am back at home for Christmas so you can look forward to that. Thank you for understanding and here's to next week! Emma tried the Honey and Almond and didn't really like it....but it smelt lovely! Winter Pimms is the best.